During October 2002 a trial excavation was conducted in Kafr Misr prior to the construction of a residential dwelling (Permit No. A-3763*; map ref. NIG 2399/7279; OIG 1899/2279). The excavation, on behalf of the Antiquities Authority, was directed by D. Syon, with the assistance of Y. Ya‘aqoby (administration), Y. Gorin-Rosen (glass), A. Lester (preliminary identification of bronze platter) and S. Lotan (study of the bronze platter). Remains of an ancient synagogue from the time of the Mishnah and Talmud had previously been excavated at this village in the eastern lower Galilee (‘Atiqot 25:117–134). One square was excavated in the current excavation, c. 100 m east of the synagogue, revealing a few ancient remains. The top of a well-built wall, which was founded on the basalt bedrock (W14; width 0.6 m; preserved height 0.7–0.8 m), was exposed close to surface. The wall was composed of small and medium-sized stones bonded with mortar or plaster; small sections of plaster remained on its faces. Stone collapse and accumulations of soil to the east of W14 extended as far down as bedrock (L11). Close to bedrock surface and next to a meager wall, which apparently belonged to an installation next to W14 whose nature was not ascertained, was a bronze platter (diam. c. 0.6 m; Fig. 2). 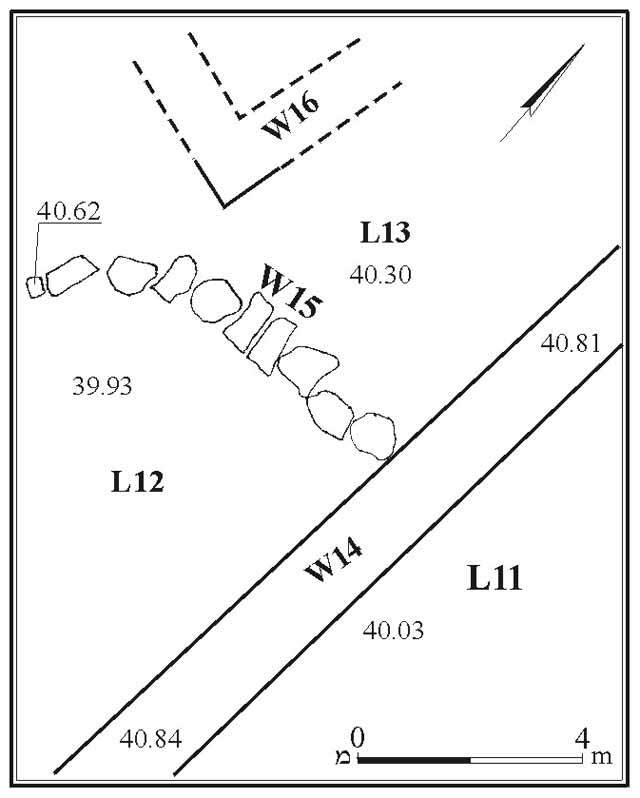 West of W14, at a depth of c. 0.5 m and below a modern refuse dump, Wall 15 was exposed. It was built of natural basalt stones set on a thin soil layer and was preserved two courses high. The corner of a well-built wall (W16), composed of dressed basalt stones, set directly on bedrock and preserved four courses high, was discerned in the northwestern part of the square. A few potsherds, some very close to surface, were collected: the rim of bowl from the end of the Byzantine period (seventh century CE), a jug handle of buff clay and the neck of a bottle dating to the Early Islamic period (eighth–ninth centuries CE). 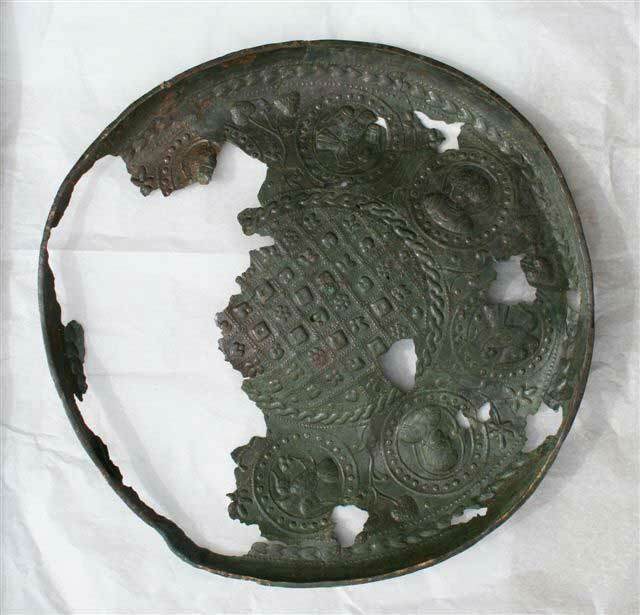 The bronze platter, preserved almost in its entirety and made in a Byzantine style, is dated to the eleventh century CE (it will be published separately). Based on the finds, it is presumed that W14 and W16 were built during the Early Islamic period. The modern refuse dump, which partially covered the walls, indicates that at the end of the twentieth century the walls could still be seen on the surface. Another possibility is that all the walls were from the modern era and only the bronze platter was an ancient, undamaged relic.